Dream Theater arranged, in collaboration with the fan clubs and fan communities online, a treasure hunt culminating in the reveal of the album title and artwork for the new Dream Theater album “Distance Over Time”, for release in February 2019. See this link for the reveal! This is a series of several articles covering the entire process of solving the treasure hunt as released by Dream Theater and “Team Jacobi”. This is the third article, covering the next couple of puzzles. Stay tuned for more! Freddy then proceeded to reply with either ‘door’ or ‘key’ to each of six messages he had tweeted from the small hours of Thursday 23, to the morning of that day. The tweets are part of the lyrics to “The mirror” and “Strange déjà vu” – songs from Awake and Metropolis pt. 2: Scenes from a memory, Dream Theater’s thirth and fifth studio albums, respectively. The video shows guitarist John Petrucci and bassist John Myung in the studio where the band had been recording their new album since Tuesday, July 17; throughout the video, both Johns give updates on the process up to that point, and mention what they were about to begin working on. On the table to the left of John Myung, there’s a white paper with a grid on it. This suggests that the grid in the paper in the video –which is ‘hard to read’– indicates the URL –the ‘location’– where to solve the puzzle. The picture shows John Petrucci recording a guitar line in the studio. Add a dot here, a slash there, and you get goo.gl/iNmLYk – a short-link created with Google’s soon to be discontinued URL shortening service. The shortened URL is https://vailrenovations84552723.wordpress.com/1-39, the URL of a password-protected entry at Vail Renovations’ site. The grid on the left is a ‘square’ arrangement of the first 81 characters in the tweeted string, and the one on the right contains the following 81 characters; the final five characters in the string –‘35647’– appear below the ‘?’ grid. After that, there’s the need to ‘solve one’: the numbers’ square, which –after removing every ‘0’– is an actual Sudoku, made up of ‘symbols hidden by design’. The most common form of Sudoku is a square grid made up of nine rows and columns, and nine sub-squares of 3 by 3 cells. The goal is to fill the cells so that every row, column and sub-square in the grid contains the digits from 1 to 9. Though French precedents for the game are dated as early as the 19th century, Sudoku as it’s known today first appeared in the 1980s in Japanese newspapers, introduced by publisher Nikoli, Co.; in the Western world, Sudokus became popular in 2004, after Judge Wayne Gould promoted them in British and American media. For instance, one can start by determining that the only cell available for ‘6’ in the lower-right sub-square is the one above ‘4’, because all the others are part of a row or column which already has ‘6’. By applying the same reasoning, the positions of ‘6’ in the lower-left and upper-left sub-squares can be easily found as well, and so on. In the resulting grid, we ‘identify the phonies’: the positions in the letters’ square to be removed. Using ‘master’ as key (which Freddy’s first tweet had hinted at), the string decrypts as ‘InthePresenceofEnemiesTheHereticandtheDarkMaster’ – the full title of a song from Systematic chaos, Dream Theater’s ninth studio album. By opening the ‘door’ https://vailrenovations84552723.wordpress.com/1-39 with the ‘key’ InthePresenceofEnemiesTheHereticandtheDarkMaster, the puzzle is solved. The video, recorded by guitar tech Matthew Schieferstein, shows a couple of Aurora 16s (audio converters developed by the Lynx company), one of them running. Throughout the video, five pairs of lights on the screen of the converter twinkle with the same pattern, but starting –and therefore finishing– at different moments. (In other words: the display is similar to a canon.) There are two different lengths of time during which lights are ‘on’, as well as two different ones when they are ‘off’. As exposed earlier (see Background), ‘Bogie’ is the nick-name and screen-name of Nick Bogovich – longtime Dream Theater fan who gained legendary status within the band’s fan communities after solving a previous challenge involving Morse code in January 2005. This suggests that the lights on the screen represent Morse code. This is Morse code for ‘OCTAVARIUM’ – the name of the title track of Dream Theater’s eighth studio album. This suggests that ‘the one that was before’ is the URL to ‘Freddy Jacobi’s Great Quiz #1’ (see Puzzle #5), but that ‘it’s time to repeat’ it replacing the ‘fifth’ letter in the quiz’s name. Indeed: http://37311319.com/puzzl2.php, the URL of Freddy’s ‘Great Quiz #2’, which –like ‘#1’– consists of 14 fields to be filled in. Each field from #1 to 13 is preceded by a line in the lyrics to a Dream Theater song; therefore, its correct answer is the title of the song in which those lyrics are found. Field #14 is preceded by an edited version of an early promotional photograph of the band. (Taken by Brad Hitz circa 1992/1993. ); the correct answer there is ‘Majesty’. The message redirects to a password-protected entry at Vail Renovations’ site, with the URL https://vailrenovations84552723.wordpress.com/1-11. By inputting Octavarium11 –formed by the Morse code message, and ‘the last two digits’ in the URL– as password, the puzzle is solved. This is a reference to former singer Charles Dominici, who designed Dream Theater’s logo –known as ‘the Majesty symbol’, after the original name of the band– based on one of the marks with which Mary Stuart –Queen of Scotland in the 16th century– signed her embroidery work, produced while imprisoned in England in the 1570s and ‘80s. Mary’s death in 1587 was a consequence of the decryption of letters she exchanged with conspirator Anthony Babington, about a plot against then Queen of England Elizabeth I. Therefore, Freddy’s tweet suggests that his image is text encrypted through the cipher Mary and Anthony used in their correspondence. Naturally, all of this suggests the existence of a Dream Theater-related playlist on the streaming service Spotify –whose logo is a green circle– as the next clue. The playlist consists of thirteen Dream Theater songs. The initials of the titles of the songs form the acrostic ‘ENIGMAMACHINE’ – the title of an instrumental piece on Dream Theater’s twelfth and self-titled studio album. The second question in the post is related to the story of Metropolis pt. 2: Scenes from a memory, Dream Theater’s first concept album. In the story, the main character goes through past life regression therapy, and witnesses a series of events through the eyes of a young woman named Victoria Page; ‘the year Victoria died’ was 1928. The short-link in the Facebook post redirects to a password-protected entry at Vail Renovations’ site. By inputting EnigmaMachine1928 as password, the puzzle is solved. Dream Theater arranged, in collaboration with the fan clubs and fan communities online, a treasure hunt culminating in the reveal of the album title and artwork for the new Dream Theater album “Distance Over Time”, for release in February 2019. See this link for the reveal! This is a series of several articles covering the entire process of solving the treasure hunt as released by Dream Theater and “Team Jacobi”. This is the second article, covering the next couple of puzzles. Stay tuned for more! The video shows drummer Mike Mangini in the studio where the band had been recording their new album since Tuesday 17; throughout the video, Mike plays several phrases in odd-time signatures – one of his domains. That was some 3, and 7, and 3, and 11, and 3, and 19. Thanks to ‘Hyrul’ for sharing the screen-shot. The decrypted text is part of the lyrics to “Six degrees of inner turbulence” – the title track of Dream Theater’s sixth studio album. The password, in turn, is an acrostic made up of the initials of the names of the song’s movements. Freddy’s link redirects to one of 71 password-protected entries at Vail Renovations’ site named ‘1’, their URLs ending with the format ‘/1-(number)’. By inputting OAWTGSAL as password, the puzzle is solved. The image shows a Digital Audio Workstation of drummer Mike Mangini. The quiz consists of 14 lists of up to five Dream Theater-related terms. The task is to determine and input the correct ‘answer to each’ list in its corresponding field. The terms are the titles of songs from Dream Theater’s first demo, a cassette tape recorded in 1986 while the band still used its original name Majesty. (The demo was officially re-issued on CD in 2003 as part of The Majesty demos 1985-1986, the first release of YtseJam Records.) Amongst other things, the demo is notable for featuring the only recordings by the band with first singer Chris Collings. Therefore, ‘Chris Collins’ is the correct answer. As a consequence, this determines that the correct answer to every other list labelled ‘(a)’ is a name. Re-ordered, these letters spell ‘THEGREATDEBATE’ – the title of a song from Six degrees of inner turbulence, the band’s sixth studio album. The message redirects to a password-protected entry at Vail Renovations’ site. By inputting TheGreatDebate as password, the puzzle is solved. Each tweet is the title of a Dream Theater song. Every ‘p’ in the tweets is upper-case where it should be lower-case, and vice versa. This suggests the relevance of the letter ‘p’ as a next clue. Indeed, by adding ‘p’ at the end of Mike’s ‘domain’, the URL obtained is that of a new game by Freddy: a 400-cell, square nonogram named ‘Caught in a Web’ – the title of a song from Awake, Dream Theater’s third studio album. Nonograms were invented at the end of the 1980s by Japanese artist Non Ishida, and first became popular in the Western world at the beginning of the following decade, after British newspaper The Sunday Telegraph started publishing them weekly. For each row and column, the series of bracketed numbers above it or to its left indicates quantities of consecutive correct cells in that field; therefore, rows #6, 11 and 16 and column #10 consist exclusively of incorrect cells. ‘ACOS’ is an acronym of “A Change Of Seasons” – the title track of Dream Theater’s first EP. As for ‘\r’ and ‘\n’: they are the characters that represent the commands ‘carriage return’ and ‘newline’ for starting a new line when writing on computers. (In other words: the ‘Enter’ key.) Some operating systems –like Linux– employ one of these characters/commands, but others –like Microsoft Windows– use both, in that order. When adding ‘acoscarriagereturnnewline.zip’ to the nonogram’s URL, a file with the same name begins downloading. The video shows keyboardist Jordan Rudess in the studio where the band had been recording their new album since Tuesday, July 17; throughout the video, Jordan plays a four-note melody in the keys of C major and E♭ major. This suggests that ‘can you hear me?’ is a clue to the puzzle. The second URL in the ‘soundfile’ text is that of a password-protected entry at Vail Renovations’ site. By inputting CanYouHearMe as password, the puzzle is solved. The square is made up of 16 rows and columns of two-digit numbers; the crossword on the Imgur image consists of 16 rows and columns as well, which suggests that there’s a relation between it and the square. Indeed: when removing all ‘00’ pairs in the square, the resulting numbers are arranged in the same fashion as the cells to be filled in the crossword. There’s a total of 22 different two-digit numbers in the crossword, which suggests that the words comprise 22 different letters, each of them represented by a unique number. Since there are no clues about the words to be filled in, educated guesses help solve the game. For instance: the longest word in the crossword is the 13-letter long horizontal one in the first row. Judging by the numbers, the word’s 3rd and 9th letters are the same, as are the 11th and 12th, and the 6th and 13th. The only Dream Theater-related word with that format is ‘MISUNDERSTOOD’ – the title of a song from Six degrees of inner turbulence, the band’s sixth studio album. Fourteen of the fifteen blue cells are filled with the letters that comprise ‘I Walk Beside You’ – the title of a song from Octavarium, Dream Theater’s eighth studio album. The extra blue cell contains an extra ‘B’. Each of the two blue cells filled with a ‘B’ has a small ‘mark’ found in its upper left corner; as an example, the one in the first row –in the word ‘BE’– has the mark ‘1’. Naturally, this suggests the existence of a missing 6-related mark. Indeed: ‘6=2’, which can be found to the right of the word ‘SIX’ by overlaying the crosswords image and the original photograph and studying their differences. The letters in the cells of marks ‘1’ to ‘5’ spell ‘BITLY’ – the name of a popular URL shortening service. This suggests that the other seven marks indicate the characters with which to form a short-link. Indeed: bit.ly/2vUBFCs. The above is the short-link of http://37311319.com/file.zip, the URL of a ZIP folder download. Image by and courtesy of ‘el_deadache’. The URL is that of a password-protected entry at Vail Renovations’ site. By inputting X_THESILENTMAN as password, the puzzle is solved. Dream Theater arranged, in collaboration with the fan clubs and fan communities online, a treasure hunt culminating in the reveal of the album title and artwork for the new Dream Theater album “Distance Over Time”, for release in February 2019. See this link for the reveal! This is a series of several articles covering the entire process of solving the treasure hunt as released by Dream Theater and “Team Jacobi”. This is the first article, covering the first couple of puzzles. Stay tuned for more! Image and words published by the official Dream Theater Facebook page on Wednesday, July 11, 2018. The photograph would be re-posted the following day in the ‘Dream Theater going into the studio in 2 weeks’ thread in Dream Theater Forums –the band’s largest on-line forum-type community– by member ‘Freddy Jacobi’, and two weeks later by the official Dream Theater Facebook, Twitter and Instagram pages. Taken the day prior, the photograph shows singer James LaBrie near the kitchen in the studio where the band had been writing the music for their forthcoming fourteenth studio album since Monday, June 11; on the wall, a memo/call-sheet gives directives to the band members about activities scheduled for that day, including a live video Q&A session broadcasted through the band’s official Facebook page. Of course, ‘the link’ doesn’t redirect to ‘the live Q&A’, or anywhere at all: ‘uggcf://vf.tq/jbfrur’ is not a valid URL, but https://is.gd/wosehe encrypted through the ROT13 cipher instead. A company hired by the band to design and run the hunt. This puzzle will rely on logical skills, computer skills, and social skills. But I know this; you can’t solve this alone. You have to get help from friends. And even more importantly; you have to make new friends. All of the above turned out to be true, as hunters developed a strong bond by collaborating with –and learning from– each other. Furthermore, people dedicated much of their time to helping ‘Hyrul’ expand his ‘DREAM THEATER’S ARG / TREASURE HUNT’ Google Doc, which would prove to be popular enough for Freddy to turn it into a clue itself on two occasions. The band looking at the fan-made Google Doc in early September. Picture tweeted by Freddy on Friday, October 12. The next Background section in this document deals with examples of the incisive ‘detective work’ that Dream Theater’s followers are known for, as well as precedents of the band posing challenges to –and interacting with– their fans. The section after is a Walkthrough of the treasure hunt, not unlike those written for RPGs and other videogames. The majority of the hunt appears to still be playable even though the treasure has already been found so, if you want to give it a go by yourself, skip that section. Keep in mind that, just like many RPGs, the hunt is not linear: most puzzles are unrelated to each other, so you can read about –and attempt to solve– them in different orders. Following the walkthrough, there’s a Summary of key dates related to the hunt, concepts and tasks required, and what the treasure was and who found it. A short history of Dream Theater online fan communities, going back to 1993. A short history of the band’s online presence, going back to 1996. A timeline of the production cycle for the band’s forthcoming studio album. A list of key anniversaries that will occur in 2019. Thank you, everyone at the #dt Discord channel (specially ‘Hyrul’, ‘el_deadache’, Max Kühnau, ‘Beatrice’, ‘Sinister Rectus’, ‘Pax’, ‘rwcrell’, ‘Xiad Mabsax’, ‘Atakan’, ‘Burgersinthesky’, ‘Cam’, ‘IDontNotDoThings’, ‘Joachim_YourMajesty’, ‘CezShreddR’ and ‘rblakefoster314’), for the many things you taught me throughout the past three months. Thank you, Dream Theater and Freddy, for entertaining us and making us learn. This was worthwhile. And thank you, uncle Mario, for introducing me to the band when I was 15. On Thursday, June 6, 2013, a video titled ‘In Studio Ep1’ was uploaded on Dream Theater’s YouTube page. The 2-and-½ minute clip represented the first in a series of updates by the band on the production of their self-titled 12th studio album, ahead of its September release date. Towards the end of the video, the camera shows engineer Richard Chycki looking at his computer’s screen, which displays a MIDI grid for one of Jordan Rudess’ keyboard tracks. The grid can be seen twice, very shortly, while Chycki talks about the five-piece’s attention to detail. A member of Dream Theater Forums going by the alias ‘The Fatal Tragedy’ took a screenshot of the video, re-created the MIDI file based on the image, and shared his work in the ‘DT in the studio again!’ thread, on Saturday 8. And that’s how the ‘Lucid dreams’ movement in “False awakening suite” was first listened to, more than three months before the track’s release. Later, on Thursday 12, Rai ‘Weymolith’ Beardsley –moderator at DTF, and one of the people involved in the band’s online presence– posted a picture on his Facebook page, consisting of a screenshot of the soundwaves for a 2-hour FLAC file named ‘DT Xmas Live v1’, opened in the Goldwave audio editing software. Image by and courtesy of Rai ‘Weymolith’ Beardsley. That evening, another DTF member named ‘Nest777’ noticed that the soundwaves for the final 20 minutes of the file coincided with those of the song “The Count of Tuscany”; he proceeded to identify all songs –minus one– corresponding to the rest of the soundwaves, and shared his conclusions in the ‘Interesting Post On Weymolith’s FB Page This Morning’ thread. Two hours later, fellow member ‘TheAtliator’ identified the remaining song, corrected one of the titles, and suggested that a specific additional song should have been part of Beardsley’s file as well. And that’s how the track-list and concept of the Happy Holidays live compilation was discovered, ten days before the album’s announcement/release. The above are only but two of many examples of how dedicated Dream Theater fans can be. That level of ‘detective work’ has only become more frequent and incisive ever since the band started actively using social media as a means of updating their followers on the progress of the writing and recording stages of their studio albums – i.e., at the beginning of the current decade. In August 2003, after Train of thought had been recorded (but its details not yet revealed), Dream Theater posted on their website MIDI conductor charts and pictures of whiteboards with handwritten notes taken during the writing process of the instrumental “Stream of consciousness” from the forthcoming album. The pictures detailed certain aspects of the piece –such as length, tempo, time signatures, and keys– but gave very vague information about melodies. (For instance, two sections were called ‘Beatles B to G’ and ‘E♭Evil Di Meola’.) Furthermore, the post offered tips on how to interpret the information found in the pictures, asked fans to create and share a CD with their version of what was abbreviated in the whiteboards as “S.O.C.”, and indicated rules and prizes. An initial deadline of October 1 was soon postponed two weeks, by which time the band had received over 50 entries from 4 different continents. The winning composition (by Andy Rowland and Ant Law) was announced in January 2004, and eventually played at every Dream Theater tour date that year, during the ‘house music’ that concert-goers listened to before the band hit the stage; what’s more, the top 7 selections were compiled into a CD by Theater of dreams –then the “Dream Theater International Fan Club”– as a souvenir to its members. In December 2004, then drummer Mike Portnoy released a DVD called Live at Budokan, featuring the isolated drum tracks from the band’s video of the same name (recorded in Japan in April); also included throughout the DVD was audio commentary by Portnoy. One of his comments was that the band had hid something ‘special’ in the studio version of “In the name of God”, released a year earlier. On New Year’s Eve, a member of Portnoy’s message board with the screen-name ‘drumfan256’ created a thread asking fans about this; similar threads were opened 3 weeks later by fellow members suggesting what they thought the ‘nugget’ was, with Portnoy eventually letting them know they were incorrect. On January 24, member ‘DarrylRevok’ wrote on ‘drumfan256’s thread that, at 5:51 in the song, he was hearing sounds resembling Morse code. Two days later, Portnoy commented that the answer was indeed somewhere in that thread, after which Nick Bogovich –longtime Dream Theater fan nicknamed ‘Bogie’– worked on ‘DarrylRevok’s idea and discovered the complete message in Morse code, heard very subtly in the song from 5:51 to 6:07. That evening, Bogovich posted his discovery, which Portnoy confirmed solved the mystery. Recently, Dream Theater has experimented with various approaches when promoting an imminent release. In August 2011, 1-minute snippets of songs from A dramatic turn of events were posted in different YouTube channels and music news portals. Throughout August and September 2013, the band shared on their official Instagram page fragments of artwork from the forthcoming self-titled studio album and Live at Luna Park DVD. In October 2015, an invitation to “Choose wisely” one of two paths (or both) popped up when visiting dreamtheater.net; soon, the plots, characters, places and map related to the story of The Astonishing –as well as the album’s track-list and videos– started being revealed through e-mails, social media, and a specific site. The 2018 treasure hunt seems to have been created with Dream Theater’s fan base in mind, with the examples and challenges described above as precedents. Additionally, a key aspect of the hunt was the creative use of a variety of social networks, websites and software to reveal information – something the band had been doing for the previous three album cycles, as exposed earlier. The link redirects to the WordPress page of a certain company called ‘Vail Renovations’, supposedly ran by Freddy. Thank you for calling Vail Renovations. Play close attention. The password you seek is the last name of the designer of the most Dream Theater album covers, and the year that Dream Theater reached their highest peak on the Billboard charts. Between 2005 and 2013, Canadian artist Hugh Syme designed five Dream Theater studio album covers – the most by any designer. Black clouds and silver linings, one of the albums whose artwork Syme worked on, debuted at #6 on the Billboard 200 chart the week of Saturday, July 11, 2009; this is to date the group’s highest peak on the popular publication. Therefore, the ‘password’ is Syme2009. In the ‘Contact’ section at Vail Renovations’ site, Freddy also offers the possibility of contacting him through a form, with ‘Email’ as a required field. Thanks to Rob Webster for sharing Freddy’s e-mails. By inputting Syme2009 as password, the puzzle is solved. The picture shows bassist John Myung in the studio where the band had finished writing the music for their forthcoming fourteenth studio album the day before; indeed, the camera captures John checking out Reddit –specifically, Dream Theater’s fan community (or ‘subreddit’) on the platform– on a computer screen on Friday, June 29. Indeed: using ‘84552723’ –the number in the URL of Vail Renovations’ site– as key, ‘OpfxuWtlass’ decrypts as ‘GlassPrison’ – the title of a song from Six degrees of inner turbulence, Dream Theater’s sixth studio album. The text is https://vailrenovations84552723.wordpress.com/look/ – the URL of a password-protected entry at Vail Renovations’ site. By inputting GlassPrison as password, the puzzle is solved. Note that there’s a typo in “In The Presence of Enemies”: the letter ‘o’ is missing. The many hours between consecutive tweets suggest that these numbers form the IP address 159.65.85.240. 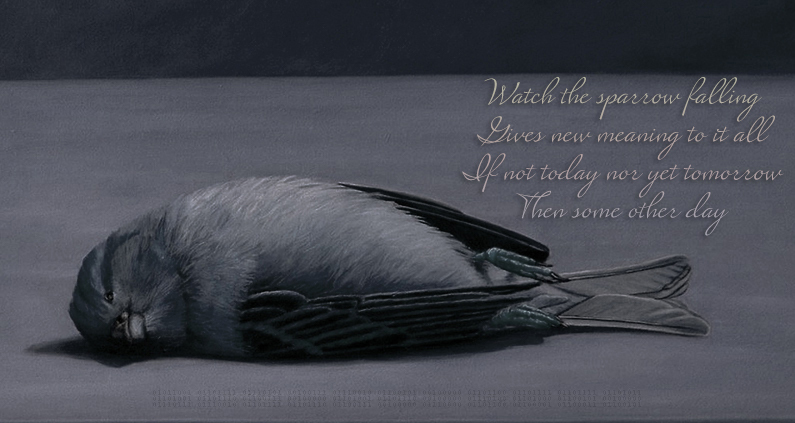 The text to the right of the sparrow is part of the lyrics to “Pull me under” – a song from Images and words, Dream Theater’s second studio album. These numbers consist entirely of zeros and ones, which suggests that the sequence is ASCII code written in binary system. ASCII –acronym for ‘American Standard Code for Information Interchange’– is a code for informatics developed in the 1960s by then American Standards Association (nowadays, the American National Standards Institute), and consists of the representation of 95 printable –and 33 ‘control’– characters written in four different numeral systems, including binary. The name ‘more.txt’ on the last line suggests that there’s a text file to be found as part of the image. Indeed – the image is a self-extracting archive. (In other words: it’s an image which also works like a ZIP folder.) Its content is, precisely, ‘more.txt’. As ‘rc4’ suggests, the first line is a ‘box’ encrypted through the RC4 cipher, and the ‘key to open’ it –according to the paragraph about ‘inspiration’– is found in the Bible. There’s a special providence in the fall of a sparrow. Therefore, ‘the key to open the box’ is ‘Matthew 10:29’. The video shows guitar tech Matthew Schieferstein and engineer James Meslin in the studio where the band had been recording their new album since Tuesday 11; throughout the video, Matthew dials a 10-digit number on his cellphone. Presses key at the bottom. Judging by Matthew’s thumbs’ movements, the dialed area code can be 510, 518, 619, 629, and 810. Of these, 518 had already appeared in a phone number to be called (see Puzzle #1), and is the only one assigned to an area in New York. (Which is the state where Freddy lives.) This suggests that the dialed area code by Matthew is 518. Thank you for calling. The password is ‘Finally Free’. When the ‘password’ heard during the phone call is ‘surrounded by the missing’ letter in Freddy’s Twitter poll, the actual password oFinallyFreeo is formed. By inputting oFinallyFreeo as password, the puzzle is solved. This past February, Dream Theater USA had the pleasure of interviewing John Petrucci before the G3 show in Fort Lauderdale, FL. We talked about the G3 tour, Dream Theater’s recent signing with Inside Out, the Images, Words and Beyond tour, the new Dream Theater album, the fans’ response to the Astonishing, Guitar Universe 2.0, the Liquid Tension Experiment, and even squeezed in some gear talk. How is the G3 tour going this time around? It’s amazing! I mean I can’t say enough about all these guys, not only Joe and Phil, but all the people in their bands, the crew… It’s a really cool feeling of friendship and cooperation and everybody’s just so into the music and the playing. After the jam every night, we walk off the stage just smiling and talking about how great it was, so it’s been really cool. Is it less pressure than touring with Dream Theater? Yeah. It’s a different kind of gig. I mean in some ways it’s more pressure, because I’m only playing in a trio and there’s no vocalist and no keyboards. The guitar is taking on basically everything. In other ways, there’s less pressure because it’s not a big production, and the show is shorter. There’s not as much going on, it’s not like the history of all these different albums and everything. So it’s more of a liberating feeling as well. So it’s a little bit of both. It’s a balance. Dream Theater recently signed a long term contract with Inside Out, which I think it’s the perfect fit since they have such a Prog roster. How do you see that impacting the band? This is only the 4th label we’ve ever been signed to in our entire career. In fact, when we were signed to ATCO, for Images and Words, that was an eight album deal. It was the longest thing we ever signed and it went through all the way to the last album with them. Then, we went to Roadrunner of course. We haven’t experienced changing to a new label too often, but I will say there’s definitely a renewed sense of enthusiasm. You have new people that you’re working with, and you know they have a lot invested. They want to prove themselves and they want to look at this as an opportunity to take the band to another level. So they’re infused with all this great energy, enthusiasm and attitude, and I think that’s really going to help us. For us it’s a new relationship too, so we want to make sure everything goes smoothly. Thomas Weber, who signed us, we’ve known him for a long time. He used to come see Dream Theater play back in the day. He’s always been into progressive music and he had this label going and it developed and developed. It’s funny because he would approach us every time “Oh man! I really want to sign you guys” and finally the time was right. The offer was great and everything kind of lined up, and here we are. You just wrapped up the 25th Anniversary tour for Images and Words, how do you feel now that the tour is over, and how do you feel I&W holds up 25 years later? it”. So it was a sort of combination of old and new. It was a ton of fun. James kept telling these old stories, and it was nice reminiscing about those days. How do you feel connecting and playing Images and Words will help influence the style of the new album? It could help inspire it, from my perspective. Playing all of that music from that time period, not only Images, but a Change of Seasons, To Live Forever and all that, it kind of brought me back to 25 year old me, or even younger… what I was thinking, how I was writing the kinds of chords I was playing, how we interacted, and how we thought. I can see some of that carrying into the next album. I mean we are who we are now. We’re not the same band to some degree, certainly not all the same members, but it did spark a re-connection to something about that writing style that is really special. It’s a very melodic style. I think in some ways maybe it’s not as complex as where we’ve gone lately. (At the time) we were influenced more by Maiden, Marillion, and stuff like that. We got more classically influenced and kind of more evolved and developed. If you listen to the writing style on the Astonishing, some of the chord progressions and movements are really sophisticated. So compared to something like a chord progression on Pull me Under, it’s simple in comparison, but there’s something about throwing those kinds of larger shapes at a song that make it enjoyable as well. So hopefully we can strike a balance, where we continue with the knowledge and experience that we have as far as our sound, in house developed, but we also remember some of the direction and simplicity, and nature, of how we wrote back in the early nineties. So it’ll be interesting. We’ll see what happens. There’s been a lot of anticipation for the next DT album. What is the timeline for Dream Theater entering the studio and a new album being released? We’re still talking about this, so I don’t want to give any solid information but it’s not going to be any sooner than January 2019. If you think about the timeline, I’m doing G3 until May. We still have to get into the studio itself to write and produce an entire album, deliver it, do the promotion. If you’ve backed that up, however many months it takes, and you are looking at the earliest, January, but I don’t even know. Obviously with the new label they’re very interested in making everything as great as it can be. So they’re going to want to have a plan with as much advance notice as possible. So as soon as we lock something in it’ll be public information. No need to keep it a secret or anything. We just don’t know right now. Rumors have been swirling for a long time about you using an 8-string for the next album, what can you tell us about that possibility? It’s kind of a question mark because me and Ernie Ball Music Man are talking about doing an eight string together, we are designing one. However, we don’t have one yet. There’s a lot on their table. So it’s a project that has started, and it’s a matter of if it’s ready in some form by the time I enter the studio to write. If I have one in my hands, I will use it. If for whatever reason it gets delayed or something, then it is what it is. So you know in a perfect world they’ll have a prototype, or something even better ready in time, and they’ll send it to me and I’ll start writing with it. That’d be fun. You have JP Guitar Universe coming up in August, and you have some amazing talent lined up: Guthrie Govan, Tosin Abasi, Tony MacAlpine, Al Di Meola and many more. What can participants expect from version 2.0? Will there be any changes? I really enjoyed how the first one came out. A lot of what we did, we’re going to continue. It’s at the same location which is in Long Island, at the Glen Cove Mansion, and which was perfect because the campers got to stay at the facility, and then all the events were in the same building. So that worked out great. This time around we have 3 new instructors. A lot of (the previous instructors) came back, but Al Di Meola is new, which for me, when he said “yes” I wanted to hug him through the phone. He’s going to do a one day appearance only. He’s going to do a special masterclass that day and a concert at night. So that’s fantastic. Guthrie, I have not met, but from what I’ve seen him play on YouTube, I’m just blown away. The guy is just ridiculous. Amazing! I’ve heard nothing but great things. So that’ll be exciting. Also, my friend Jon Finn from Berklee, who’s been a professor there for a long time, and whose band toured with Dream Theater a long time ago, is coming. I loved his drummer so much that I stole him for Suspended Animation (Dave DiCenso). So Jon is going to bring a Berklee contingent to the camp as well. What everybody enjoyed so much last time was that it was like a university summer program. There was so much instruction, so much information. We’re going to keep that. In addition, we’re going to have more involvement from the Ernie Ball family, which is great. Last time we did a barbecue and I was flipping burgers, and that was great, but this time, if all plans go as scheduled, Sterling, who is an award winning Pit Master, is going to barbecue for us, and then also do some speaking and playing. So we’re working all that as well. One other thing, and campers will know more details as the time approaches, is that we’re going to try to make sure that everybody can see and get instruction for all the guests instructors. Last time it was kind of hit or miss, you had to choose with the schedule. So we’re going to try to break it up into groups so that people can do rotations. What would you say to someone that feels intimidated about coming to Guitar Universe? After some delay, The Astonishing Novel is finally out, what can readers expect from it? It definitely took longer than expected. I read it and it’s fantastic! It makes me smile. Peter Orullian, who wrote it, had so many great conversations and brainstorming (sessions) with me. He made the story so much richer and deeper. It fills in all the blanks and it tells the backstory of the characters, and why they are the way they are. It has so much more action and battle scenes, and it’s really, really exciting to read. The artwork that was done for is fantastic. It was supposed to be ready before Christmas but that didn’t happen. This is all new to us. I’ve always said that if I could go back and do this all over again, and we had all the time in the world, I would have done the book first. Do the book first, then do the tour, and then have the CD available at the shows. That’s a good point because as a standalone piece of music it’s a lot to take in. If you’re not being absorbed by the story, you’re kind of like “well, why are they playing this? It doesn’t sound like Dream Theater” But, from the response that I got from people that came to the shows, and when we’d end the show and the credits were rolling, all I saw was smiles and hands in the air. So it would have been nice to release the book first. Have people leave (the show) saying “we gotta hear that again” and then pick up the CD… but we did it all backwards, because of the nature of the industry, and what you have to do. We always get questions about Liquid Tension Experiment. The rest of Dream Theater has their own projects going on, is that inspiring you to get out and release more of your solo work? You know, it’s not that I’m not inspired. It’s mostly because, and this will sound so lame and I say it all the time, it’s mostly because I don’t have the time, you know? For example, this part of the year where Dream Theater’s not on the road and we’re not in the studio, would have been the perfect time. But what am I doing? I’m touring. And then what do we do when I get back from this? We have to go into the studio… and what happens after that? We’ll start promotion. So it’s really been very difficult for me to squeeze it in. Another thing is, I get so much satisfaction being in Dream Theater- playing this music, writing this music with the guys, being fortunate enough to say that they’ve let me produce it, and haven’t killed me yet. It’s so artistically and creatively satisfying. So as fun as the solo music is on an instrumental level, it’s not like it’s burning inside of me, like” I have to”. I get so much out of Dream Theater. At the same time, I do understand that a lot of people really enjoyed Suspended Animation and I have a whole bunch of new songs. It’d be great to get them recorded and done. You actually do have some new songs? Oh yeah. I have a ton of songs. I play the three of them tonight. Actually one of them isn’t mine, one’s more of an interpretation of the song. You’ve reached a certain level of mastery on your craft, how do you continue challenging yourself musically and creatively? Do you still feel that connection to the audience while playing? Has it changed over the years? First of all, I think the connection with the audience is really, really important, because that’s what this whole event is. People are coming to see you perform. It’s an interactive occasion. You’re not playing to a wall. You’re playing to real, live people who have paid a lot of money or sacrifice to get there. So I always try to take on this attitude that I have a responsibility to deliver the best I can do. When playing with Dream Theater I certainly try to look out, connect with people as much as possible. Having said that, the complexity of the music that we’re doing, the fact that we use in-ear monitors, it kind of closes us off to the audience, and we’re hearing a lot of things going on. Sometimes it’s easy to get in your own little bubble world. With G3 I’m not using in-ear monitors, I’m using traditional wedges and musicians earplugs, and in a lot of ways, I can hear the audience. It’s more ambient. It’s really liberating as a guitar player and I think it helps me connect more with the audience. Plus there’s no vocalist, so I can’t hide in my little world since I have more of a responsibility. Sometimes it’s hard depending on the venue and how far away you are where you can see, but it’s definitely important. Not generally. Sometimes at the start of a tour, I am a little anxious. If I do get a sense of nerves, I have things like just regular breathing and things to calm me down. I love to drink coffee but I found out recently that if I only have my morning coffee then I’m less likely to have any sense of heightened anxiety before I go on, which is nice because the goal is to walk onstage feeling calm, in control, and that everything that led up to that moment, your practicing and everything is going to come out the right way. Things like nerves or anxiety don’t help that at all. So yes the coffee thing is interesting. Yeah it was really cool. We went to Dubai for the first time, which you hear so much about, and that was really interesting. You know seeing how that part of the world has developed, and how much money is there, and what it’s turned into, it’s amazing. I mean it’s outstanding. Also, we played in India for the first time. You hear all these different stories about going there, and how it’s going to be, and we just had a wonderful time. There’s always this really welcoming thing that happens, whether we are in Israel, Italy, or we are in Chicago, people embrace us being there. When you look out and you see people from all over, like in Dubai, it’s one of the most diverse audiences we’ve ever played to, and you see everybody getting into it, smiling and singing. It doesn’t matter what they’re wearing, what they look like, where they are from, it’s just like this large community of people that are there because they’re enjoying the music. As foreigners in those countries, it just makes us feel so welcomed, which I think is really special. I don’t think a lot of people get to experience that, and it’s really something we don’t take that for granted, you know? It’s really amazing. T: Some gear questions now… what determines which guitar you’re going to play each night? Well in general since the Majesty came out, since we developed that, I just fell in love with that instrument and I play it nonstop. Having said that, the other models that we came out with are also outstanding instruments, so I always want to give them some love as well. For the Images tour, I was talking to Maddi one day and I thought for Images and Words we used to play an Ibanez guitar, basswood body with a Floyd rose on it. Maybe it would be good to play the JP-16, which is a basswood body with a Floyd rose? It had a similar sound and that was my reason for using it. Always. I’m annoying. Here’s an interesting thing about playing a concert using in-ear monitors versus not using them. So when using the in-ear monitors, depending on your mix, it basically sounds like a CD. It’s an unbelievable sound, but at the same time you hear everything right there. So as I’m playing, I’m just “too much bass”… I drive myself crazy. I’m the worst tweakaholic of all time. Playing with just wedges and earplugs, you don’t get the same sonic experience, so it doesn’t sound as hi-fi and everything, but in a lot of ways it’s more enjoyable because it’s old school just playing guitar, and so my head doesn’t go to that tweak space. So it’s a cure for tweaking. T: Have you had a chance to play around with the AXE FX-III? I have not played around with it yet. That’s my plan. Before we integrate into my rig which is the plan ultimately, we got to make sure that everything is going to transfer and work. I’m just going to have fun with it backstage and kind of play around with it. I’m really excited for those guys. It’s a great release and that they put a lot of work into that. I saw some comments online and just to clarify, with the Axe FX, I just use the effects. As wonderful as the modeling is, I use it for the effects. My JP-2C, that’s my whole sound. Even on this tour, just before I go on and Maddi just checks it, you hear the audience… it’s like a beast just got unleashed… it’s such an awesome amp. T: Any new guitars you’re looking forward to? I’ve been talking about this version of a Majesty for couple of years. I had this idea of a carbon black Majesty with a spalted maple top and cream binding, and cream pickups. They finally did it! I showed it to my wife, and I’m like what do you think? And she said “it’s like a steakhouse guitar” because it’s like so manly. So we call it the Steakhouse Majesty. It’s my dream guitar. At NAMM, Music Man also unveiled some new colors for my guitars. The new JP6 one is FireMist Gold. They also did different BFR ones. If you look at the series of my guitars since the Majesty came out, we did the original version, we did an Artisan series, we did a Precious Metal series, and now the Monarchy. I think that if the general series keeps changing too much, it puts too much out there and people can’t keep up with it. Right now we’re on the Monarchy series which is gorgeous, those will be around for a while, but in the meantime the BFRs will do some very special versions of those, and they just do those in limited quantities. The thing about Ernie Ball Music Man is that every instrument they make they are like works of art. They’re so special. They’re so detailed and so beautiful. You can’t go wrong.